Over the course of my detailing experiences I have come across many different kinds of “issues” my clients vehicles have had, and they trust in my experiences to keep their vehicles safe. If I ever want a second option on something, I can call any of the large network of pros I know for their experience or take on the issue I’m detailing with. Having some of the top detailers in the world working together makes for a tag team detailing enterprise like no other. It’s when you get so good at your trade that you feel you “know it all”, and that is when you fall far from your perch and can possibly mess up…sometimes that mess up can change history. Here at Reflections Detailing of Utah we had the chance to work with history! Vintage cars have serial numbers and if all the numbers for the various parts match on a car, its value is greatly increased. Ferrari’s are typically well documented cars in the vintage world, and the better the documentation, the higher the value the car will keep. Maintaining originality on these vehicles is also very important to the historical value. WOW! While just a artful pile of metals, parts, and paint…this was history! One oops or improper use of cleaners and the Ferrari documentation that makes this a true piece of history, will forever be altered. Where to start? How do I calm my nerves? No problem, I started with cleaning the wheels! Easy, that is what most people do. 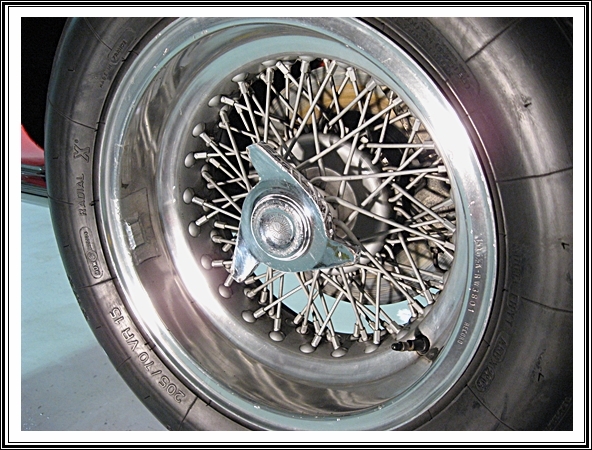 I started in being careful cleaning each spoke with one of the finest cleaners, P21s Wheel Gel, it was a perfect choice; neutral based, long dwell times, cleans most anything given time, and would help preserve history. I broke out my toothbrush, well my old one, worked the cleaner all over the wheels and I was singing away, things are gelling, no pun, and I’m working. These spokes are hand-painted original to the car, and there are 5 of them, yes a spare in the trunk. I could have used other cleaners, or even a steamer, but with my assessment they all posed a risk with altering history…one I wasn’t comfortable taking. As I was allowing the gel to dwell and do its thing, the owner returned to see what was going on. He watched, made mental notes, and didn’t say a word for a few moments…this doesn’t worry me as it happens a lot. He inquired what my game plan was so far, and I shared my understanding to care for history while meeting the cleaning goals…this brought some added pressure and thought to the process so I started with the wheels. 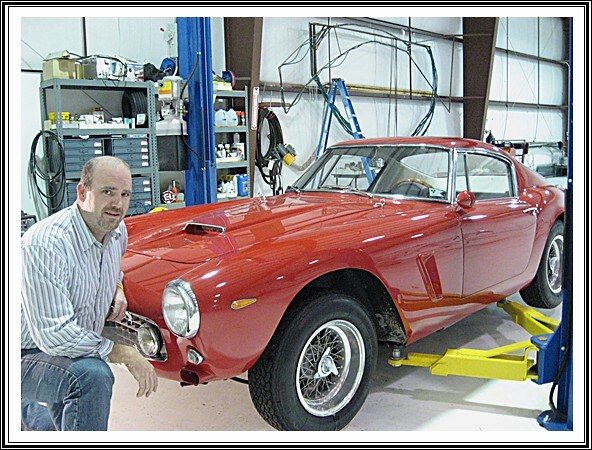 While I knew the Borrani wheels are hand crafted and original to this car, his words stopped me in my tracks…”good choice, the wheels are only $50,000 for the set, as that is how much they are worth to the documentation of the car”. We both had a good laugh at that…no pressure! Whether they were worth $1000 or $50,000 I knew my P21s wheel gel was the right choice. I hope to post up some different parts of this project for the purpose of learning and enjoyment of automotive history. I didn’t detail document this restoration, as the sense of responsibility to the vehicle had my main attention. I had to have a photo with this woman, being so rare. A classy woman don’t you think? These are racing wheels called knock offs. 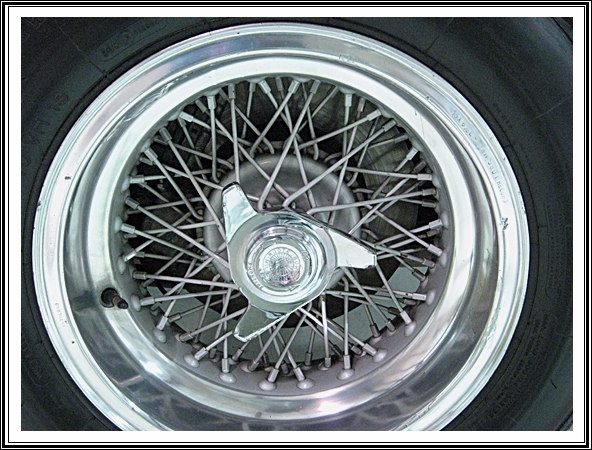 The center three prongs are hit with a mallet and the wheel spins off the post…no lug nuts per se. 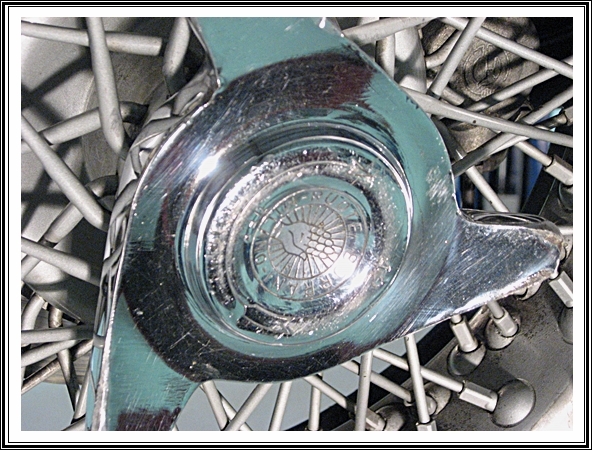 If you look closely you can see the spokes are painted a grey color. The wheel was balanced with a weight and then taped on the rim! I cleaned/polished the uncoated aluminum rims with p21s finish restorer, which as an anti oxidation property to it. 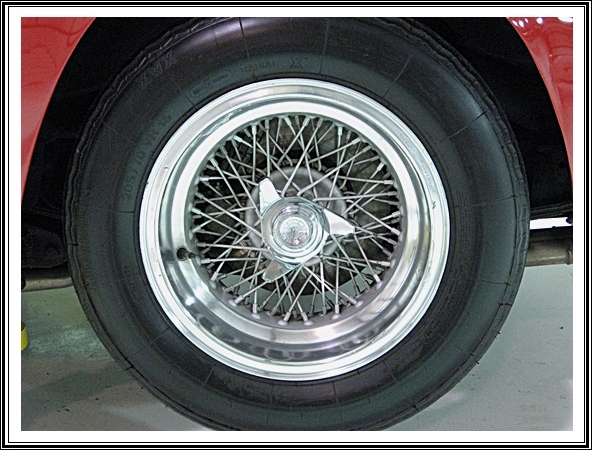 In keeping with the historical / vintage look of the car, I used a matte finish for the tires using 303 Aerospace Protectant. This also provided a bit of UV barrier as this was a shown car. The final product is a wheel that has been cleaned, shined, and most importantly preserved the history and value of this beauty for a few more generations.